1. Heat the oil and cook the onion until soft but not discoloured. Stir in the seasoning. 2. Add the tomatoes, purée and 120ml water, and then stir well. Heat until simmering then add the courgettes and red pepper. Cover and simmer for 15 minutes. 3. Stir in the honey and chickpeas. Mix the cornflour with water. Stir into the pan and heat until thickened. 4. Cut the haddock into chunky pieces and gently stir in the tomatoes. Cover and simmer for 5 minutes. Add the prawns and heat until really hot. 5. 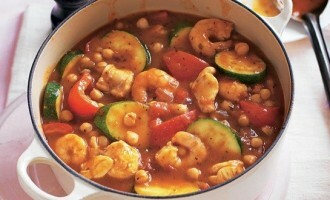 Serve with cous cous, mixed with coriander.